Avocados. Avocados are rich in healthy fats, vitamins, and minerals, making them the ideal food to combat cramps. Omega-3 fatty acids found in avocados fight inflammation and relieve pain. Salmon. Salmon is full of essential fatty acids, including EPA and DHA, both of which boost mood. Salmon is also rich in B vitamins that help combat fatigue. Brazil nuts. These nuts are a great source of selenium, vitamin E, and fatty acids that hydrate skin, reduce oil production and fight inflammation to decrease breakouts. Greek yogurt. Greek yogurt is high in calcium, which helps to reduce bloating and cramping. Because Greek yogurt is also high in protein, it also tames sugar cravings. Dark chocolate. Dark chocolate contains tons of antioxidants that decrease fatigue and increase feel-good hormones in the brain. Caffeine. Many women experience mood swings, including anxiety, right before their period. Caffeine can intensive anxiety symptoms. Instead of coffee, reach for decaffeinated teas. Salt. Temporary weight gain and bloating are two major PMS symptoms. Eating salty processed foods will only make these symptoms worse. You should avoid fast food, chips, and other junk foods. Alcohol. Alcohol can increase bloating and mood swings, leaving you feeling sluggish. Try cutting out alcohol in the week or two before your period starts to reduce PMS symptoms. Refined sugar. Eating sugary foods can result in mood swings and cravings. Instead, eat natural forms of sugar, such as fresh fruits. You can combat even the worst PMS symptoms by incorporating the right kinds of foods into your diet. Focus on eating whole grains, fresh fruits and vegetables, and lean proteins. 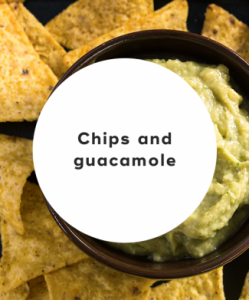 All that's required for this simple recipe is some organic flaxseed chips, two avocados, one lime, and some salt and pepper. Mash the avocado in a bowl, then squeeze in the juice of one lime and mix together. Season with salt and pepper, and dig in with some organic flaxseed tortilla chips. This simple recipe makes for an easy breakfast. 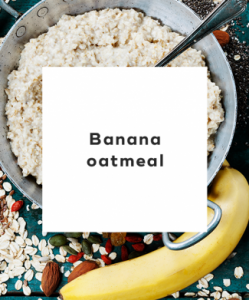 You'll need 1/2 cup of oatmeal, one cup of milk, one small banana, one tablespoon brown sugar, and two tablespoons flax seeds. Boil the milk in a pot, and then add the oatmeal, stirring for 5-to-10 minutes until cooked. Then chop up the banana, and mix it into the oatmeal. Finally, mix in the brown sugar and flaxseeds. 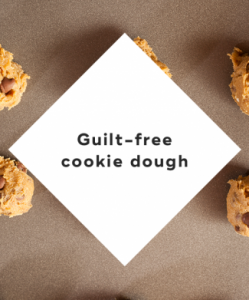 Fight sugar cravings with this healthy cookie dough alternative. All that is required is two tablespoons almond butter, one tablespoon flour, one tablespoon wheat germ, two teaspoons maple syrup, one tablespoon dark chocolate chips, and a pinch of salt. In a small bowl, combine all ingredients together. This classic breakfast meal seriously slashes PMS symptoms. 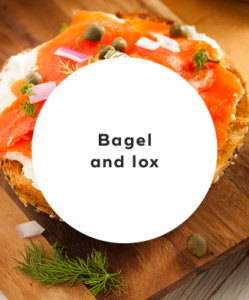 You'll need half of a whole wheat bagel, one tablespoon cream cheese, and two slices of smoked salmon. Toast the half of a whole wheat bagel to your liking, and then spread with cream cheese. Top with smoked salmon. 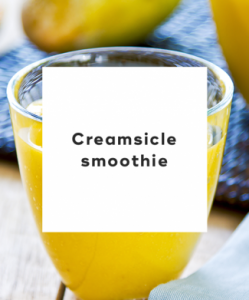 This orange ginger smoothie improves mood swings, bloating, and cramps. All that's required is one cup of orange juice, half cup plain Greek yogurt, one teaspoon vanilla extract, two teaspoons freshly grated ginger, and some ice. Blend all ingredients together in a blender. PMS symptoms are probably the worst part of that time of the month. But the good news is you can reduce the severity of PMS symptoms by changing your diet. Simply eat healthier foods right before your period while cutting out unhealthy ones. You'll no dread Aunt Flo's visit. "11 Best Snacks for PMS Relief," Prevention, November 24, 2014. "18 Foods that Help Fight PMS," Women's Health, May 22, 2014. "5 Foods that Reduce PMS Symptoms," Fitness, n.d.
"Foods to Avoid During Your Period," Livestrong, October 3, 2017.